Download the CBS Sports App today and get instant tournament news and alerts, plus play Brackets! You can pick based on mascots, based on your limited knowledge of most of the teams ... or you can trust science that’s been proven to work. 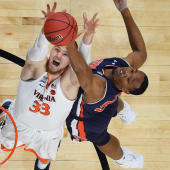 Last year SportsLine’s computer simulation correctly predicted eight out of nine NCAA Tournament upsets, including six out of seven double-digit seed upsets. So yeah, it’s probably worth your time to take a look before you fill out your bracket. They ran thousands of simulations this year to come up with the perfect 2017 NCAA Tournament bracket, and find out which teams will pull off the biggest upsets and found among the upsets that Minnesota is poised for a first-round ouster. Click the link below to get the full results of the sim.